Every day when I come home from work, one of the first things I do is open the back door. I like the light coming in my kitchen and the kittens love to look outside. Most nights Clio sits at the back door for hours, watching. Birds, mostly. Until it starts getting dark. Once dusk starts to fall, I turn on the back porch light. 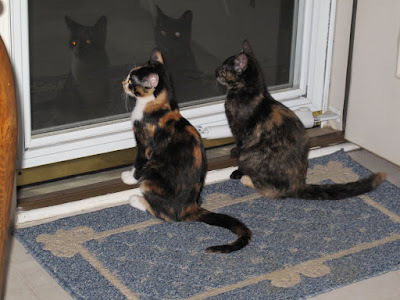 Calliope joins her then in the Nightly Bug Watch. Actually, some kids I know are quite entertained by bugs. Unfortunately, they are not content to only watch them. They have to pick them up, contain them, chase people with them, and so forth. The worst is when my son plays with the slugs. The slug goo is so disgusting and does not come off with just soap and water. What a great picture! Spot loves to sit in his window seat at all times of the day. I think he considers it his responsibility to supervise the neighborhood. He's not terribly entertained by bugs, though. I suppose that's more for kids and kitties.